The short, soft-spoken former Army nurse was asked how she coped with the harsh realities of working in an Army hospital in war-torn Europe during World War II. You could hear a pin drop as this 96-year-old veteran nurse stood under the shade of a small tent outside the Fort Meade Museum at Sturgis, South Dakota last weekend (7/17/16). She shared stories of her experiences during World War II, from the D-Day landings at Normandy to the historic “Battle of the Bulge” that helped change the direction of the war. Marcella Ryan LeBeau’s story began on the Cheyenne River Reservation at Promise, South Dakota, where she was one of five children born to Joseph and Florence Ryan. Her old hometown of Promise – nestled along the banks of the Moreau River – is gone now, inundated by the massive waters of Lake Oahe. Her name belies the rich Lakota heritage of which she is so proud. Her mother was a member of the Two Kettle Band of the Cheyenne River Sioux Tribe and a descendant of Rain in the Face, who fought at the Battle of the Little Big Horn. Her great grandfather, Joseph Four Bear, was a reluctant signatory to the infamous Fort Laramie Treaty of 1868. Her father, a rancher, was Irish. “Growing up we had no electricity and had to haul water in. I remember my father had a big garden, and geese, horses, and other animals. She convinced her father that she and her siblings weren’t getting a proper education, and they transferred to the St. Elizabeth Mission School at nearby Wakpala. After getting her diploma from St. Elizabeth’s, Marcella enrolled at St. Mary’s School of Nursing in Pierre. She completed her studies there in three years, graduating in 1942. After working for a time at the Public Health Hospital at Fort Thompson, Marcella took her first out-of-state job in Pontiac, Michigan. World events, however, were deteriorating, and the United States was in the clutches of World War II. Shortly thereafter, Marcella and her friend Marie Weaver decided to “see the world.” They were among the 104,000 young nurses who were recruited by the American Red Cross to become Army nurses and serve at Army hospitals at home and overseas. They enlisted in April 1943, hoping they’d be able to serve together as brand new 2nd Lieutenants. But Marie was assigned to go to Colorado, and Marcella was sent to Torney General Hospital in Palm Springs, California for "training." It was the old El Mirador Hotel, which the Army had bought at the outbreak of the war and converted into a 1,600-bed general hospital. 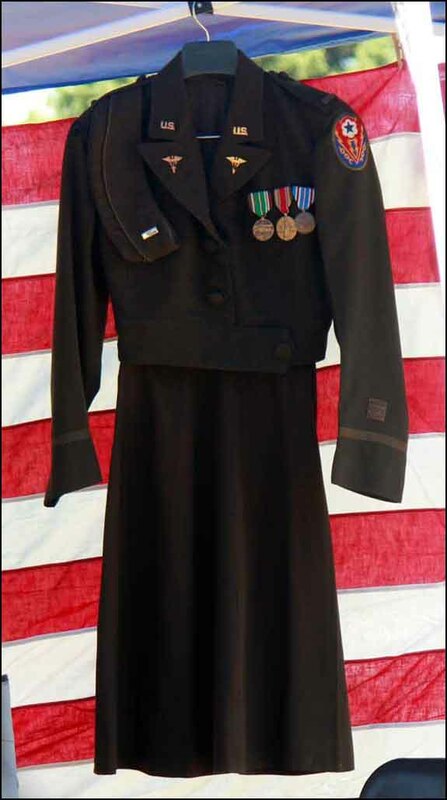 While undergoing no real military training, Lt. Ryan was issued her uniforms and was temporarily assigned to work in the psychiatric wards. She then received orders to join the 76th General Hospital unit in Boston and was soon on a troop train headed for Chicago and then Boston, where she and others awaited their overseas assignments. Shortly thereafter, she found herself aboard the troop transport USS George Washington for the 14-day voyage to Liverpool, England. The United States was making preparations for an invasion of Nazi-occupied France. After arriving at Liverpool, nurses of the 76th General Hospital were transported to the coastal community of Llandudno, Wales, where the new arrivals underwent orientation to the European Theatre Operations and preliminary professional evaluation. While there, medical personnel lived in hutted camps or were billeted with families. After about a month, Lt. LeBeau, who had lived with a family in a private home, was assigned to the medical facility at Leominister, England, about 100 miles northwest of London. There she worked in the psychiatric ward – but soon submitted a request to be transferred to surgery. In May 1944, their first patients began arriving in the surgical ward. The work schedule was somewhat routine. Then came June 6, 1944 – D Day. The work continued at a hectic pace for days on end. By mid-August, the Allies had secured Normandy and were on the march toward Nazi-occupied Paris. Lieutenant LeBeau and her unit were ordered to Southampton to embark aboard boats headed for Normandy. Channel storms kept the vessels carrying the Army nurses and other troops at bay for three days on their crossing to the continent. As they finally approached the shore, they wrestled their way down a rope ladder to a landing barge for the final leg of the journey to the beach. LeBeau had been suffering from a severe toothache and immediately went to a field hospital – literally in a cow pasture – for a root canal. Nurse LeBeau became patient LeBeau, but not for long. She was soon back on the job. Although much of Normandy had been secured, it was definitely a war zone. “There were still land mines and many German tanks that had been knocked out in the invasion,” she remembered. On August 25th, the Allies liberated Paris from German control, and Lt. LeBeau and her colleagues were on their way the French capital. The tide was turning for the Allies as they began pushing German troops back toward their homeland. LeBeau was temporarily assigned to the 108th General Hospital in Paris, where they treated Allied casualties as well as German prisoners of war. A few weeks later, Allied forces regained the Belgian cities of Antwerp and Liege. LeBeau’s 76th General Hospital was ordered northward to the 1,000-bed hospital at Liege, where they would handle casualties from France and other war zones along front. While the Allies seemed to be gaining the upper hand against the German army, things changed quickly. “At one point we were told to get packed and be ready for evacuation,” LeBeau remembered. With more than 600,000 Americans engaged in the fighting, casualties were high – more than 89,000, including 19,000 deaths. Many of the wounded were sent to Liege for surgery and hospitalization. “We had a wooden building that had been built for surgery. I worked closely with two corpsmen and one nurse,” LeBeau recalled. The city remained a target of intense aerial bombardment by German V1 and V2 “buzz bombs.” Some medical units and hospitals in the Liege area suffered casualties and damage not only from V-weapons, but also from conventional bombing and long-range artillery fire. Army reports indicated the city was blasted with as many as 1,500 such devices. Hardest hit among the medical facilities was Lt. LeBeau’s 76th General Hospital unit on January 8, 1944. The Army reported 24 patients and staff killed, another 20 injured, plus buildings and equipment that were damaged. There was little time to relax. While there was an Officer’s Club in Liege, Marcella and many other nurses never went there, because they felt there was too much drinking. They often found respite by visiting the home of a Belgian woman who worked at the hospital laundry. She would invite them for tea and tarts, real treats in a time of severe food rationing. The ravages of war leave behind many casualties. For Lt. LeBeau, one incident remains vivid in her memory. But even in the harshness of war, there were moments of humor, and Mrs. LeBeau reflected on an incident at the Army hospital in Liege when a red-headed Dutch patient approached the pretty young Army nurse. “American soldiers all have pin-up girls to help take their minds off the war,” he boldly proclaimed to LeBeau while handing her a photograph of himself. The photo was promptly tacked up on the bulletin board. Within ten days of the German assault on the Ardennes, Adolf Hitler ordered his troops to halt their advance, stifled by dogged Allied resistance. By early February 1945, the Allies had retaken all the territory they had lost. The “Battle of the Bulge” was over, and the war was nearing its end. Hitler committed suicide on April 30, and the Germans surrendered unconditionally a week later. The war was over. Lieutenant LeBeau completed about one year at the hospital in Liege and then was on her way home. She was discharged at Des Moines, Iowa in February 1946. She was awarded three bronze stars – for the Rhineland, Northern France, and the Battle of the Bulge. The government of Belgium also presented her and others of their unit with special medals. Those, however, would not be the end of many special awards for the girl from Promise, South Dakota. As she contemplated returning to South Dakota, there was little to attract her. Her father had fallen ill and was living in the “Old Soldiers Home” in Hot Springs. So she went to Chicago and moved in with her younger sister, Johanna, who was in the Army Nurse Cadet Corps at St. Luke’s Hospital. Marcella took a job as a private duty nurse. But in the next year or so, went to work for a hospital in Rapid City. The following year, on September 4, 1947, Marcella Ryan married Navy veteran Gilbert LeBeau at Moreau, South Dakota. Both hailed from the Promise area. “Gib” was a Gunner’s Mate Petty Officer and served at Pearl Harbor and later aboard two ships during the war. The LeBeau’s had eight children. After they returned to the Cheyenne River Reservation, Marcella was active in her children’s school activities and as a leader in 4-H. She also continued her nursing work with the Indian Health Service at Eagle Butte, South Dakota, retiring as Director of Nursing after 31 years of service. But “retired” may not be the best description of this much-honored Lakota elder. She and a granddaughter established a sewing business, and Marcella also became involved in gardening, care giving, and continued to share her experiences from many years in nursing. She became a member of the tribal council – one of just two women elected to the body, and she also served as secretary for the Wounded Knee Survivor’s Organization. 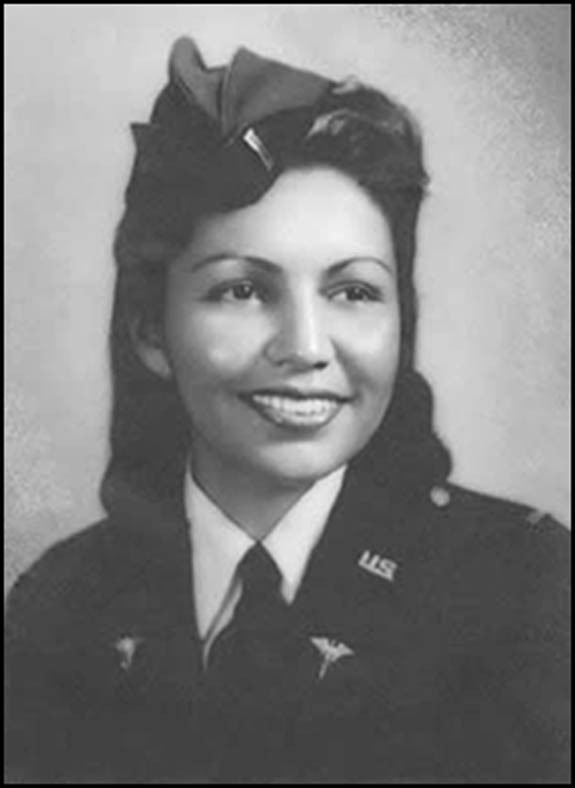 As a long-time nurse, she was also instrumental in getting smoking banned from tribal offices. Ties to her Lakota culture run deep for Marcella. In 1999, after she and her son, Richard, had worked many years to recover a Lakota Ghost Dance shirt from a museum in Scotland, it was finally returned to South Dakota. The shirt had been wore by a Lakota warrior who died at the Wounded Knee Massacre in 1890. But sometimes, people forget. Society forgets. So it is good to remember. Her many friends and colleagues from the 76th General Hospital at Liege, Belgium, held reunions numerous times over the years to recall their experiences and renew friendships. The gatherings took place in Des Moines, Iowa, and were, she said "great therapy." Mrs. LeBeau and her friend Esther Westvelt Pierce made the trip every summer they were held. Alas, the once robust group of Army medical personnel has dwindled and the reunions are no more. The French remembered First Lieutenant Marcella Ryan LeBeau. 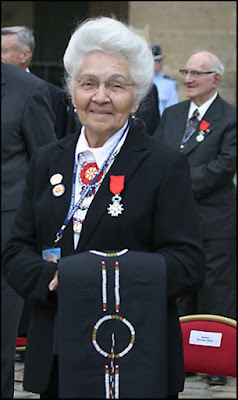 She was among 100 World War II American veterans flown to Washington, D.C. in 2004 and awarded France’s highest civilian award, the French Legion of Honor (Chevalier de la Legion d’Honneur) at the French Embassy. It was the 60th anniversary of D-Day, and the honored veterans were then flown to France to visit Paris – and later to tour the beaches of Normandy. When she was inducted into the South Dakota Hall of Fame in 2006, Mrs. LeBeau was recognized not only for her Army achievements, but also for her 31 years of dedication to nursing. 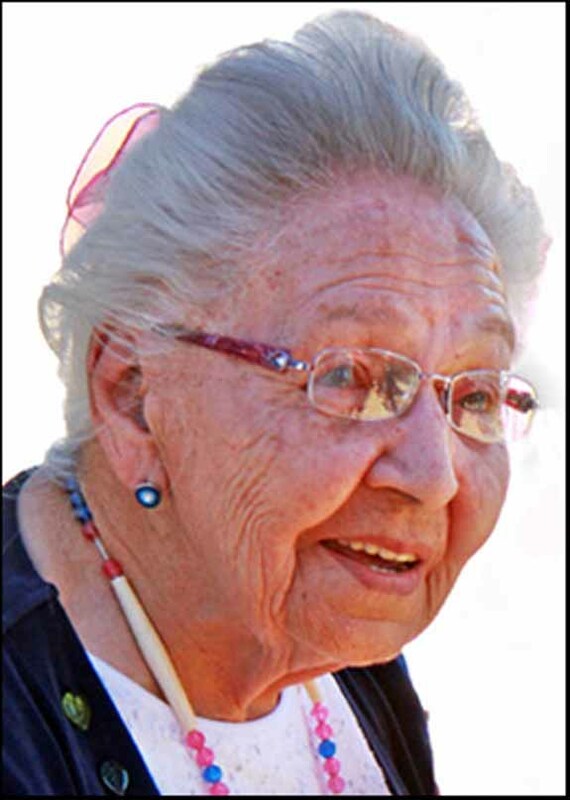 A founding member of the North American Indian Women’s Association nearly a half century ago, Marcella remains a mentor and confidante for many young Lakota women – and her inspiring story reaches across generations and cultures. Of her many experiences during World War II and in her long nursing career that followed, Marcella particularly remembers and often shares one story – about Eugene Roubideaux from the Rosebud Reservation in South Dakota. “I was working one night in a Shock Ward – like an Intensive Care Unit – and was asked to see this patient. He had lost both legs, and they were afraid that he might try to commit suicide. So I went to see him. His name was Eugene Roubideaux. I took him newspapers from home, visited with him, and offered to write letters home for him, but he didn’t want to contact anyone. I went over to see him often…and then, one day, he was gone. “After the war, I came back to the United States. For 40 years I looked for him. Every place I’d go to a nurse’s meeting, I’d ask if anyone knew Eugene Roubideaux, but I could never find him. “Then one day I met a young lady who came to our hospital to introduce us to a new form to be used at the hospital. It was an emotional moment for Marcella, who was overcome by the news. Mrs. Rafferty gave Marcella her father’s address and phone number and told her that he had divorced, remarried, and raised a large family. He was living in Yankton. “I couldn’t call him right away, but eventually I did. “I’ll never forget,” he responded. For Marcella, who shared the story with the Veteran’s History Project, it was an emotional moment. It is not surprising that Marcella Ryan LeBeau wanted to honor another veteran. Nor that she continues to be active in community and tribal activities. That she remains a steadfast advocate for her family and her people. More than 16 million men and women served in the military during World War II. They are dying at a rate of about 492 veterans each day. That means our nation will likely loose almost all of them within the next decade. How fortunate we were to have had this “Greatest Generation” as our elders, our family, our friends, and members of our community – defending and nurturing us during one of the most difficult times in American history. For many of these veterans, like Lieutenant Marcella Ryan LeBeau, the challenges they faced and their achievements, were particularly significant. And a handful of them, like Marcella, continue to make meaningful contributions to their families and communities. We are blessed to have them in our midst.